Find and click on the thumbnail of the photo you want (to see the large version). Over the top of the large photo you'll see the photo's identification number (See Example). Email or send the photograph identification information to Dirtfocus (addresses at the top of this page). You can use the "Cut & Paste" feature for simplicity & accuracy. Be sure to include the event, date, and your return address information. Hover your mouse pointer anywhere over the thumbnail of the photograph of you want and read everything after the last slash (i.e. "/sla-tj-IMG_2387.JPG", See Example) in the lower left hand side of your browser (with either Internet Explorer or Netscape). In Internet Explorer: Read everything at the top of the Properties window (i.e. "sla-tj-IMG_2387_small.JPG", See Example). In Netscape: Read everything after the last slash (i.e. "/sla-tj-IMG_2392.JPG", See Example) in "Address" portion of the Properties window. Read everything after the last slash (i.e. "/sla-tj-IMG_2387.JPG", See Example) in the "Address" portion your browser (with either Internet Explorer or Netscape). In Internet Explorer: Read everything at the top of the Properties window (i.e. "sla-tj-IMG_2392.JPG", See Example). In Netscape: Read everything after the last slash (i.e. "/sla-tj-IMG_2392.JPG", See Example) in the top of the Properties window. Email or send the photograph identification information to Dirtfocus (addresses at the top of this page) or C and C Race Photos (below). You can use the "Cut & Paste" feature for simplicity & accuracy. Be sure to include the event, date, and your return address information. Directly: No charge for downloaded photographs directly off the website. High resolution copies: No Charge. Identify & request the photos you want. You'll receive a reply with Instructions to a download page. Sorry, DirtFocus does not have printing facilities. DirtFocus is a non-profit website organized to follow selected Southern California Off-Road Sports at a limited number of venues. Photographs are normally taken by staff members and are supplemented by a talented group of contributing volunteers. None of our photographers, staff, or volunteers are industry professionals, and typically donate their time and skills. 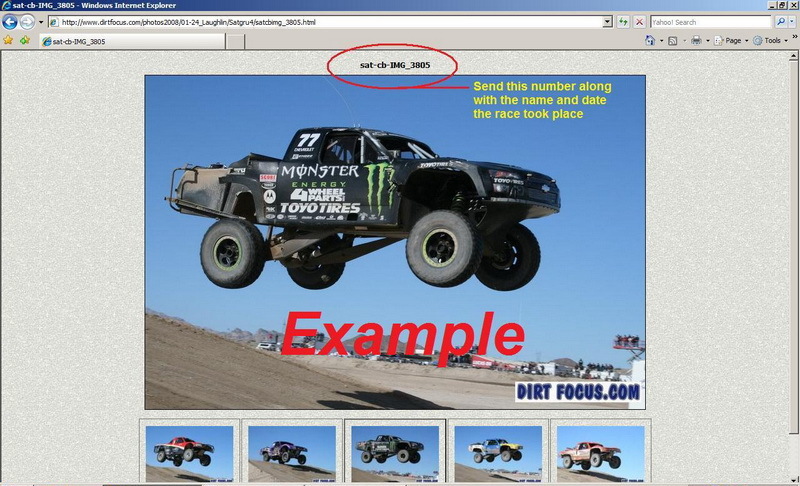 Currently DirtFocus does not have the facilities to print photographs. However, requests for high-resolution digital versions of posted photographs can be e-mailed (see how to select & order...). These full resolution copies can be taken to most office-product and web-based businesses for paper copy printing. Depending on the resolution, clarity, and detail of the digital photo file, all should provide a reasonable 4X6 print, and most will provide a good full page 8X10 print. However, as these are photographs taken by amateurs, DirtFocus is not responsible for the detail and quality of the photography. Users are cautioned to inspect photographs carefully before having them professionally printed. Race files will be archived periodically to make room for new race photos. This process will be initiated at the beginning of each year, leaving the previous three years available for viewing, plus the current year. If you are looking for photographs from archived years & no longer displayed, contact the webmaster via email with your request.